AKP’s foreign policy is becoming increasingly problematic in a region that is fragmented along secular-Islamist divisions as well as sectarian and religious differences. We may be looking at a government playing with a majoritarian matchbox in a room full of gunpowder. When the “Arab Spring” broke out in 2011, Turkey, with its booming economy and blossoming democracy was projected as a role model for the Middle East. That image is now long gone. Come autumn 2013, Turkey’s economy may still look strong, but its image as a land of political stability has been shaken by the country-wide protests of the summer and the looming polarization between those who support the protests and those who don’t. For lack of a better word, Turkish foreign policy is also in disarray. Before the Arab Spring, Foreign Minister Ahmet Davutoğlu’s “zero problems with neighbors” policy was applauded both domestically and among international audiences. In two years, Turkey has practically alienated all of its neighbors and taken sides in the Syrian conflict, while at the same time harboring a barely hidden agenda to help the Muslim Brotherhood reclaim power in Egypt, a position that is fuelling substantial tensions with the current administration in Cairo. Prime Minister Erdoğan remains the staunchest proponent of the idea that a military intervention is necessary in Syria and does not hide his animosity towards the Egyptian military. AKP, which has been in power more than a decade under the charismatic leadership of Erdoğan, does not seem to be toning down its “active” discourse and policy over the crises in the Middle East. This attitude constitutes a break not only with the pre-AKP era, but also with the AKP-led years until 2011. In the past, the Middle East most certainly “mattered,” but was not an integral part of everyday Turkish politics. At the moment, what happens in the Middle East does not stay in the Middle East but instead has become an inextricable component of policy debates and political discourses. The question then becomes, what are the causes and consequences of such a break? AKP’s recent posture in the Middle East and the salience of the relevant crises in Turkish politics can be explained by two interdependent factors. The first one got AKP where it is right now, while the second is preventing it from changing course. How AKP ended with this rather “active” position is no mystery. AKP misread the Arab Spring while at the same time exaggerating Turkey’s potential influence over the ever-complex dynamics of the Middle East, putting much fate in the longevity of Muslim Brotherhood in Egypt and the vulnerability of Bashar Assad in Syria. It is widely recognized that “zero policy with neighbors” could not be sustained in the face of the rather unexpected developments that were triggered by the Arab Spring. Turkish government had two options: play it safe by remaining on the fences or place its bet on the possibility that an active position in the face of uncertainty will bear fruits down the road, establishing Turkey as a regional leader and “pivot” (or quarterback, in the American football talk). Influenced largely by former academic Davutoğlu’s self-styled “strategic depth,” which stands for the idea that post-Cold War era presented the Turkish state with substantial opportunities that can be exploited to emerge as a beacon of “soft power” (by way of building on Turkey’s cultural and historical links with the Middle East), AKP settled on the latter option. The gamble did not pay off. More than a year ago Davutoğlu had famously declared that Esad was about to fall “in a matter of weeks.” In the fifty-plus weeks that passed, Esad did more than just holding his ground and eventually gained the upper hand in the bloody civil war that still rages on. Similarly, turning a blind eye to Mursid’s increasingly autocratic tendencies, Erdoğan put all his weight behind Moslem Brotherhood after Mursid was ousted by the military in the wake of the countrywide protests, subsequently condemning the Egyptian armed forces for having initiated a coup. As things stand, despite the pro-Mursid protests of the past months, some of which were violently repressed by the Egyptian security forces, it remains very unlikely that Mursid will return to power in the near future. At the moment, AKP faces more than just sunk costs; in both cases, it bet heavily against the actors who came on top, positioning Turkey as a direct adversary to current administrations in Syria and Egypt. In the face of these recent failures, AKP has become desperate to “save face,” especially in domestic politics. Domestic politics, rarely scrutinized by Western analysts as far as foreign policy is concerned, is in fact the second factor that shapes AKP’s recent position in the Middle East. To be precise, it would be an exaggeration to suggest that it was domestic political dynamics that pushed AKP to gamble in the Middle East in the first place; but domestic politics most definitely plays an important role in ossifying AKP’s posture, even trapping AKP in its current course. Arguably, the protests have eventually pushed AKP into a corner where it no longer seeks to appeal to the “other” fifty percent that did not vote for the party, making “its” fifty percent its primary audience. And in the eyes of the overwhelming majority of AKP’s relatively more conservative and Islamist fifty per cent, AKP has been doing “the right thing” in Egypt and Syria. Erdoğan and Davutoğlu, to be sure, do their part in emphasizing that whatever AKP is doing in the Middle East, it is the right thing, which means that their critics are merely doing the wrong thing by criticizing them. When combined, the failed gamble during the Arab Spring and AKP’s ever-growing tendency to speak only to its voter base trap Erdoğan inside discourses and policies that are pushing Turkish foreign policy deeper into the eye of the storm in the Middle East. Paradoxically, if AKP backs down from its recent posture with all the sunk costs still on the table, it may lose credibility in the eyes of the very fifty per cent it holds so dearly. This, in turn, points towards a self-perpetuating feedback effect: AKP legitimizes its foreign policy by telling its own fifty-percent that it is doing the right thing and its ever-increasing reliance on them for upholding its domestic prowess makes sure that it will keep the current course. Recently, things have been relatively calm in Egypt; so, it may be too early to comment on Turkey’s long-term influence on the rivalry between the Muslim Brotherhood and its opponents. But make no mistake. The Syrian conflict has shown that Turkey’s recent foreign policy can have more important impacts on regional stability than has been recognized heretofore. By directly supporting rebel groups in Syria, which have now become quite heterogeneous, including the presence of radical groups such as Al-Nusra and the influx of foreign fighters, Turkey has been empowering, if not creating, what is known as “moral hazard.” Well-known in economics as well as security studies and always a bane of insurance companies, moral hazard refers to situations where extensive insurance policies may encourage a policyholder to take unnecessary risks. To push the analogy further, since she will not have to bear the full costs of her actions and may still end up with a brand new car even after an accident, the policyholder may have incentives to drive recklessly, increasing the likelihood of the very accident that the insurance company is trying to avoid. In a similar vein, writing exclusive “insurance policies” for the rebels, or providing an unchecked and weakly overseen support base for them, Turkey has effectively become a “side” in the conflict. It would be a mistake to suggest that the Turkish government harbors ulterior motives in Syria; even AKP’s most ardent critics recognize that Erdoğan is sincere in his remarks about ending the conflict (still, very few question the claim that Erdoğan wants a particular “end result” that does not include Assad). Regardless of intent, the extensive “policy coverage” provided by the Turkish government is having an adverse effect on the course of the civil war. As long as the rebels can count on the unconditional support of Ankara, they can keep fighting a war that is becoming increasingly brutal, without feeling the pressure of having to negotiate with Assad for a peaceful resolution. As most spectators recognize, considering the US reluctance to become embroiled in a new Middle Eastern conflict, there are two likely scenarios: a long and extremely bloody war of attrition that will end when one of the parties finally bleeds white, or a diplomatic compromise where the opposition and the Assad regime directly negotiate under the supervision of the US and Russia. The blank checks that the rebels keep receiving are simply making the first outcome more likely. Note that Turkey is not the sole “insurance company” involved in the Syrian civil war. The US is most surely playing its part, alongside Qatar and Saudi Arabia. However, given its geography ( the Turkish-Syrian border runs for more than 900 kilometers) and the hundreds of thousands of Syrian refugees it already hosts, Turkey is bound to play a decisive role in the conflict, either as part of the problem or as a key player in its peaceful resolution. The Turkish government, however, seems to disregard any diplomatic solution that does not involve the immediate ousting of Assad. In this context, AKP’s foreign policy is becoming increasingly problematic in a region that is already fragmented along secular-Islamist divisions as well as sectarian and religious differences. We may be looking at a government that is playing with a matchbox in a room full of gunpowder. To sum up, the Turkish government gambled big time during the Arab Spring and is currently facing substantial sunk costs. That AKP is gradually moving towards a majoritarian understanding of democracy where it prioritizes its own “fifty per cent,” in turn, is trapping AKP within its present course. Unless AKP breaks out of the “majoritarian trap,” its foreign policy will gradually but surely become more unrelenting, with substantial consequences not only for regional stability, but also for Turkey, where AKP’s position in the Middle East remains a most divisive element in an already rapidly-polarizing political environment. The side effects of AKP’s Middle East policy in domestic politics cannot be exaggerated. The fault lines that separate those who support Gezi Park protests from those who don’t also separate the critics and supporters of AKP’s foreign policy, which only amplifies the feeling of rupture and polarization that has become a part of every day life. The sectarian depictions of the Syrian conflict as well as the secular-Islamist tensions that fuel the unrest in Egypt, to be precise, find themselves all too familiar and alarming echoes in Turkish political discourses. Furthermore, the Syrian conflict has already spread to Turkey. On May 11, at least 53 Turkish citizens were killed as a result of simultaneous car bombs in the border province of Reyhanlı. It is not yet clear who carried out the attack, but no one disputes the claim that it was a side effect of Turkey’s direct involvement in the Syrian civil war. Marking the deadliest terrorist attack on Turkish soil in the history of modern Turkey, May 11 was a clear reminder that once you tamper with Middle Eastern crises, they do not stay where they are born. 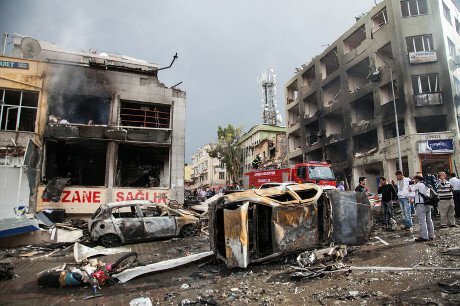 Double car bombing in Turkish border town, Reyhanli. Demotix/Bradley Secker. All rights reserved. As marginal as it may seem at the moment, the key to addressing the resultant tensions is the health of Turkish democracy. To be fair, if Turkey moves toward a more pluralist vision of democracy, the extant challenges that Turkish foreign policy faces in an increasingly unstable region will not go away; but they may be approached through more constructive and realistic frameworks. If AKP keeps sliding further into the discourse of the “fifty percent,” it is very likely that the Turkish government will create more and more demons both at home and abroad, which will only add to the current problems. A little more than a decade ago, foreign policy analysts rarely needed to look “inside” Turkey. That was the past. For better or worse, Turkey has broken out of its rusty cage as far as its foreign policy is concerned and will not be going back in for the foreseeable future. What happens in Turkey no longer stays in Turkey. Western audiences are better off paying attention to Turkey’s slide into a majoritarian understanding of democracy now, as opposed to sometime down the road when it may be too late.